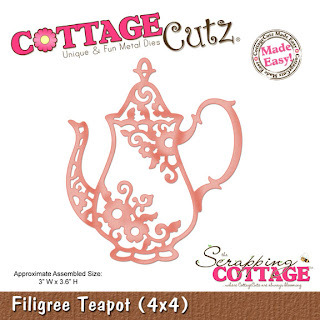 Welcome to The Scrapping Cottage Blog it's Carol here today with a 3D creation for you. Isn't this tea time set spectacular. I am so in love and so excited with the whole thing. I love tea themed things and this release has so touched my heart. All the dies are so feminine and lovely you just can't help but want it all! The ideas are endless. Other: White Card stock, Recollection Pearls, VersaMagic, Embossing Powder, tiny Prima roses, ribbon, and metallic cording from Michael's (you can find this in the ribbon section at Christmas) and glue. 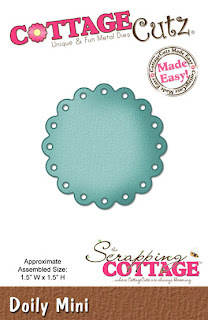 You can make these in colored card stock if you wish or use your VersaMagic pad to press the die cut on and sprinkle with embossing powder and heat set. What I did was die cut two teapots and only applied glue at the top outer edge of the tea pot, the top of the handle, and the top of the spout. Then I shaped the bottom to make it round and glued it to the mini doily. I decorated with different sized pearls, tied a couple ribbon bows and glued on a small rose. Just tie the cording at the top to make it an ornament or leave off if you want a simple favor. Here is how pretty these ornaments will look on your tree. Notice how the light captures the embossing to make it sparkle and shine. I left this one plain white. If you didn't want to make it an ornament-this would be beautiful for a bridal shower or tea party favor. How pretty this would look sitting in the center of a plate on a set table. It could be used as a keepsake ornament long after the party. You could do one for a Silver Wedding Anniversary Party or a Golden Wedding Anniversary Party as well. How about a little girls birthday party done in pink. So very sweet and so very cute! Thanks so much for stopping by to view my creations. I really do appreciate it. If you have any questions on how to assemble this just let me know and I will help you the best I can. Carol these are so pretty! They make beautiful ornaments! Super innovative idea Carol! Love it. Beautiful Ornaments Carol!! I love them all, they are all just amazingly Beautiful!!! !